2018 Ballon d’Or nominees has been released and this time the award will take place in Paris on 3rd December 2018. The Ballon d'or has been dominated by Lionel Messi and Cristiano Ronaldo over the past decade (5 times winners, each), but as we saw with FIFA’s the best award going to Luka Modric, 2018 could bring a changing of the guard. 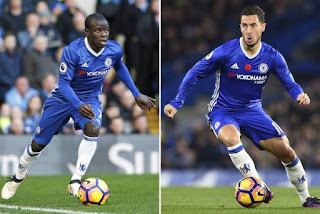 Two Chelsea players who will be hoping that is indeed the case are Eden Hazard and N’Golo Kante, both of whom are nominated for the second consecutive year. Kante finished 8th and Hazard 19th in last year’s field of 30 nominees.